Five simple ways to organize your home. When you’re the CEO, maintenance crew, custodian, art director and IT specialist for your home, wasting time searching for lost items isn’t an option. If you’re ready to liberate yourself from common clutter, here are five simple ways to organize your home. The hardest part of getting started is, well, getting started. Instead of jumping headfirst into an overwhelming situation, take it slow. For example, if your home office could use a little TLC, start with clearing off your desk and counter space. A small victory like a clean desk will spark your motivation to tackle larger projects. Repetition is the key to any successful organization. Instead of jumping into a five-hour cleaning frenzy once a month, set aside thirty minutes a day to declutter. Attacking one small task at a time will reduce frustration and keep your household running like a well-oiled machine. 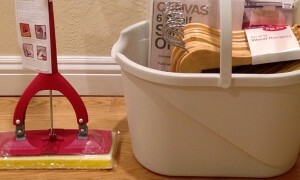 Hiring a cleaning service on a weekly (or monthly) basis is another useful tool in your clutter-cutting toolbox. Research has shown that areas with the most clutter are typically dark. Corners, closets and other dimly lit areas seem to be consistently more clutter-prone than other parts of your house. If your home feels a little dark, perhaps it’s time for a lighting update. Many times dirty laundry is a major clutter culprit. Having large laundry baskets in each bedroom and scheduling laundry days can help family members coordinate and keep laundry organized. 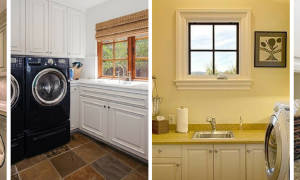 Investing in a laundry room redesign will also help sort the flow of incoming laundry. Smart storage solutions are essential to eliminating clutter and maintaining a clean home. 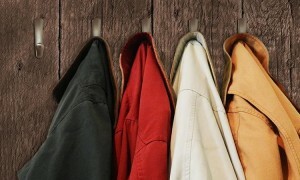 Storage options include large bins, shelves or installing new closet organizers. Hiring a designer to install custom storage units is also an additional solution for a personalized touch. Custom storage is perfect for storing and displaying handbags, jewelry or hats. The organization of your home is directly related to your peace of mind (and successful time management). Remember to start slowly, keep your end goal in mind and before you know it your home will feel brand new. These laundry room ideas provide inspiration for the most dysfunctional functional room in the home.